The workshop theme was “Challenges with Open Pits and Underground Workings”. The topics of the 27 presentations included drainage chemistry prediction, flooding, backfilling and supplemental mitigation. Presentations included issues at mine sites in Australia, Germany, across Canada and several sites in the USA. Photo: Berkeley Pit, Butte, Montana; C. Gammons. Gammons C. Geochemistry of the Berkeley Pit Lake, Butte, Montana. 13th British Columbia MEND Metal Leaching/Acid Rock Drainage Workshop. Vancouver. 2006. Guerin F., S. Wilson and R. Nicholson. Optimizing In-Pit Disposal of Problematic Waste Rock Using Leaching Tests, Portable XRF, Block and Mass Transport Models. 13th British Columbia MEND Metal Leaching/Acid Rock Drainage Workshop. Vancouver. 2006. Lawrence G. and R. Pieters. Physical Processes and Meromixis in Pit Lakes. 13th British Columbia MEND Metal Leaching/Acid Rock Drainage Workshop. Vancouver. 2006. Pieters R. and G. Lawrence. Physical Processes and the Remediation of the Colomac Zone 2 Pit Lake. 13th British Columbia MEND Metal Leaching/Acid Rock Drainage Workshop. Vancouver. 2006. Wen M. and C. Pelletier. The Concept of Steady State in Pit Lake Development: Island Copper Case Study. 13th British Columbia MEND Metal Leaching/Acid Rock Drainage Workshop. Vancouver. 2006. Martin A., J. McNee, J. Gerits and R. Goldblatt. The Bioremediation of Mine-Site Pit Lakes: Considerations, Limitations and Case Studies. 13th British Columbia MEND Metal Leaching/Acid Rock Drainage Workshop. Vancouver. 2006. Larratt H. and M. Freberg. 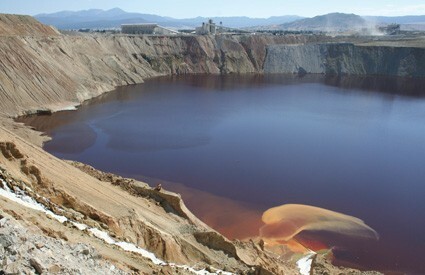 Using Pit Lakes as Bio-Reactors: Overcoming Their "Crater-Lake" Tendencies. 13th British Columbia MEND Metal Leaching/Acid Rock Drainage Workshop. Vancouver. 2006. Williams D. Golden Sunlight Mine Pit Backfill: The History and the Science of the Backfill Issues at the Golden Sunlight Mine. 13th British Columbia MEND Metal Leaching/Acid Rock Drainage Workshop. Vancouver. 2006. Wels C. and L. Findlater. Prediction of Groundwater Recovery and Post-Flooding Groundwater Quality. 13th British Columbia MEND Metal Leaching/Acid Rock Drainage Workshop. Vancouver. 2006. Huls B. and D. Caron. Introduction to the Selbaie Mine Reclamation and Role of the Pit. 13th British Columbia MEND Metal Leaching/Acid Rock Drainage Workshop. Vancouver. 2006. Venhuis M., P. McKee, R. Nicholson and B. Huls. Defining Source Terms for Backfill Component in the Selbaie Mine Pit. 13th British Columbia MEND Metal Leaching/Acid Rock Drainage Workshop. Vancouver. 2006. Dunbar D., D. Flather and S. Salvador. Modeling of Mines Selbaie Pit Lake: Calibration and Long-Term Forecasting. 13th British Columbia MEND Metal Leaching/Acid Rock Drainage Workshop. Vancouver. 2006. Aube B. Les Mines Selbaie, Zinc Removal from Pit Lake: Laboratory, Limnocorals, Batch Pit Treatment. 13th British Columbia MEND Metal Leaching/Acid Rock Drainage Workshop. Vancouver. 2006. Caron D. and B. Huls. Progress and Future Plans for Pit Decommissioning, Selbaie. 13th British Columbia MEND Metal Leaching/Acid Rock Drainage Workshop. Vancouver. 2006. Orava D. A MEND Case Study Update: The Owl Creek Open Pit Waste Rock Backfill Project. 13th British Columbia MEND Metal Leaching/Acid Rock Drainage Workshop. Vancouver. 2006. Morin K. and Hutt N. The MEND Minewall Technique: Overview and Details. 13th British Columbia MEND Metal Leaching/Acid Rock Drainage Workshop. Vancouver. 2006. Patch F. . Mine Drainage Issues at Keno Hills Mine, Yukon. 13th British Columbia MEND Metal Leaching/Acid Rock Drainage Workshop. Vancouver. 2006. Gammons C. Geochemistry of Flooded Underground Mine Waters in Butte, Montana. 13th British Columbia MEND Metal Leaching/Acid Rock Drainage Workshop. Vancouver. 2006. Jarvis A., E. Gozzard, W. Mayes and H. Potter. The Importance of Point and Diffuse Pollution in Developing Management Strategies for Long-Abandoned Deep Coal and Metal Mines in the UK. 13th British Columbia MEND Metal Leaching/Acid Rock Drainage Workshop. Vancouver. 2006. Kwong Y.T.J. Evolution of Mine-Pool Chemistry at the Sydney Coal Mines, Nova Scotia, and Its Impacts on Decommissioning Strategy. 13th British Columbia MEND Metal Leaching/Acid Rock Drainage Workshop. Vancouver. 2006. Wolkersdorfer C. and A. Hasche. Storage of LDS Sludge in a Flooded Underground Mine: Tracer Tests and Water Quality Development. 13th British Columbia MEND Metal Leaching/Acid Rock Drainage Workshop. Vancouver. 2006. O'Hara G. and R. Hammett. Britannia Mine Remediation Project: Water Management. 13th British Columbia MEND Metal Leaching/Acid Rock Drainage Workshop. Vancouver. 2006. Royle M. Giant Mine: Identification of Underground Inflow Water Types and Preliminary Geochemical Monitoring during Reflooding. 13th British Columbia MEND Metal Leaching/Acid Rock Drainage Workshop. Vancouver. 2006. Berdusco R. Sullivan Accident 2006. 13th British Columbia MEND Metal Leaching/Acid Rock Drainage Workshop. Vancouver. 2006. Tremblay G. and C. Hogan. An Update on MEND and NOAMI Programs (2006). 13th British Columbia MEND Metal Leaching/Acid Rock Drainage Workshop. Vancouver. 2006. Chatwin T. INAP: An Update (2006). 13th British Columbia MEND Metal Leaching/Acid Rock Drainage Workshop. Vancouver. 2006. Quock R. and E. Doody. A First Nation Perspective on Mining. 13th British Columbia MEND Metal Leaching/Acid Rock Drainage Workshop. Vancouver. 2006.